What caused me to blow off the dust? - Their best of collection “Snap!” comes to mind about once a month. Since I'd rather do a full record vs. a best of, here you go. FDF Comments (aka the songs) – Twelve songs and we are in and out just over 30 minutes. The rowdy “Art School” kicks it off. Weller has quick sharp guitar notes but Foxton is walking all over the bass and Buckler gets after his drum kit. Weller has a quick and pointed delivery with the vocals, almost chanting to the listener. “I've Changed My Address” keeps the frantic pace. For as quick as the music is Weller is clear with his vocals and the music is well mixed, so even though you know its a fast “punk” feel, it just feels more a like a rock song than a “punk rock” song. Perhaps its due to Weller singing vs. yelling. The band tackles a cover of “Slow Down” next. Foxton and Weller have a particular fuzz on their instruments at the start, but Foxton then gets a very clean sound on his bass. The walking bassline really stands out as they take this rock-a-billy feeling song to task. Buckler rolls across his kit to get “I Got By In Time” started. The energy of the band is what stands out most to this point, but also, as noted, the clean sound they have. This continues in to “Away from the Numbers” which sounds much larger than the three member band. The ring of Wellers guitar really gets to me as a listener here and the feel of Bucklers tom tom drums gets you right in the chest. Here, you can see what the Replacements and Husker Du would later be copying. The band then does a really fun cover of the “Batman Theme”. It is what you'd expect. A quick and fun take on it. One of the bands first “hits” come next (also first song on side 2 of the vinyl release) with “In The City”. Weller attacks the guitar riffing before Foxton comes over with the bass. Buckler wants this song to really take off, so he pushes everyone and they swell together. As busy as Weller is, the bass line seems to keep control of the whole track. It is easily one of the songs I'd tell new fans to the band to check out. “Sounds from the Street” slows it down some, but musically they are still on the go. 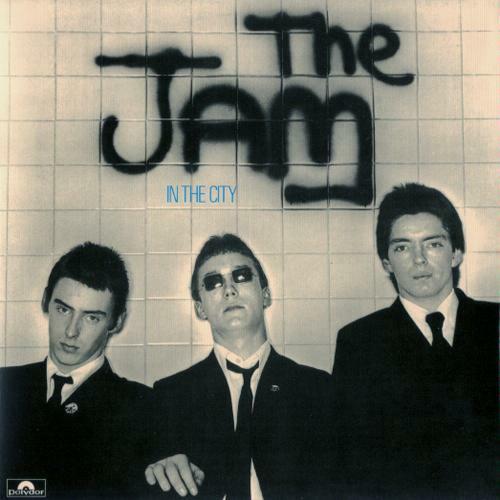 Weller is a little more pulled back on this, but you still can tell its a Jam tune. Bucker keeps things pretty darn steady as “Non-Stop Dancing” begins. The bounce is back on this song, with a bit of a 12 bar blues feel and Weller has a little jump in his step. Foxton seems to walk all over the bass section here keeping it all very interesting. Weller has one of his longest guitar “solos” on here, but its hardly a solo, he just chops right through things. “Time for Truth”is back to the more angsty version of the Jam. Weller goes after it with the vocals and the band keeps a pretty solid and steady pace. They haven't broken any new ground here. We speed it right back up as “Takin' My Love” screams out of the speakers, this continues to the album closer “Bricks and Mortar”. They end it all on a high note, and the listener just as exhausted as the musicians. Where are they now? - Foxton released a solo album shortly after the Jam disbanded and also joined “Stiff Little Fingers” for a time. Buckler formed a band called “Time UK” after the Jam disbanded, after a few singles he formed a band called “Sharp” with Foxton. Foxton also formed the band “From the Jam” later performing music of the Jam. Weller would go on to form the band Style Council (now disbanded) and works as a solo artist. There were rumors of a reunion as late as 2010 but it appears there are still tensions within the band and Weller has been quoted as saying reunions are “sad”. FDF Personal Comments (aka the Live experience) – I never saw the band live. They disbanded, honestly, before I even knew who they were. There are six “best of” collections from the band. The most notable is “Snap!” and that will give new fans a good gauge of they style of music. If you feel like it, check out my other blog where I posted my favorite records of 2012. Back next week with some "Forgotten Discs". Thank you as always for stopping over. Any ideas for 2013? Let me know via the comments.